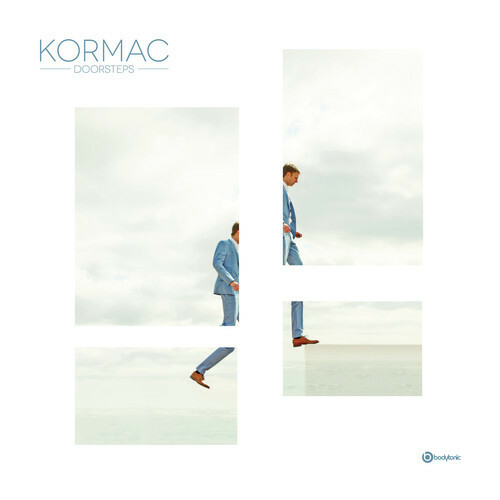 Championed by Annie Mac, DJ Food, DJ Yoda and Mr. Scruff, Dublin-based artist Kormac has returned with a brand-new single Wake Up, which is lifted from his forthcoming album Doorsteps (artwork above). Per the album’s press release, the origins of Kormac’s recorded output can be found in dusty second-hand stores and junk shops where he spent countless hours unearthing archaic and forgotten music. Fascinated with the recordings and movies of another era, he amassed a collection full of vintage instrumentals, jazz drum solos and spoken-word pieces which would go on to form the basis of his sound. This forgotten material was twisted, morphed and shaped into the instantly recognisable and idiosyncratic style heard on his first two EPs and debut LP, Word Play. Where a lot of artists cite such things as trolling through second-hand shops for source material, one listen to Wake Up is it’s abundantly clear that Karmac’s source material, appreciation and knowledge of vintage jazz, soul, and pop runs deep. Best yet, when these vintage stylings are paired with up-to-the-minute electronica, Wake Up hits the sweet spot. The song’s brilliance is thanks in no small part to the wonderfully unique and soulful vocals of Bonobo vocalist and spoken-word artist Bajka who emits a Macy Gray-like quality. Bajka’s vocals are backed by a brass-heavy production made up of tinkering vintage piano and rich, melodic but slightly haunting Gatsby-era strings, which are then juxtaposed by a deep, modern bass groove, and fat, jazz-inflected beat. There’s definitely a Portishead and early DJ Shadow appeal to the track, and complete with vintage vinyl crackle, Wake Up, like the aforementioned acts, has one foot in the now and one in the yesteryear. Despite being a DJ, live Kormac can be joined by his 10-piece Big Band that delivers an extension of the solo work. Having performed at Annie Mac’s Amp Night she described them as “the most bizarre set-up I’ve ever seen – but it really works”. Fast becoming festival favourites they quickly moved from dance tents to main stages at Glastonbury, Bestival and Electric Picnic. Thereafter they were soon performing across Europe, Asia and Africa which resulted in a tour of Australia with Portishead and The Flaming Lips. Expect massive things for Kormac and this tune. The album Doorsteps featuring the single Wake Up will be released 20 October , 2014 on Bodytonic Music.